Looking for the fastest way to turn your applications into OPC Clients? "What if you could get your hands on a powerful toolkit that you can use to rapidly develop versatile OPC Clients for Visual Basic, HMI, Web and lots more?" We're going to let you in on a big secret...use our uniquely powerful OPC toolkit and you can do all this and more, saving you up to 95% of development time. Why waste your valuable time with anything else? OPCWare Client Developer is the most versatile productivity toolkit for OPC client developers. It is the ultimate collection of OPC interface components for Visual Basic, Delphi, Excel, Labview, Visual C++, C# (C Sharp), VB.NET, ASP, MS Office, and other VBA-enabled and ActiveX containers. 4 royalty-free runtime distribution products are included, each one developed for use in all ActiveX containers which relate to user-interface and process data interface. These components are both innovative and unique, and very popular in the process control, HMI, scientific, engineering, test and measurement, simulation, and data acquisition communities. Using these components you can build first class OPC client applications with your language of choice. This software developer's productivity toolkit includes an OPC Server Explorer, an OPC Item Explorer, an OPC Group and an OPC Explorer (featuring treeview and listview visualization capabilities similar to Windows Explorer) - that's 4 components, one .ocx file, several demos, comprehensive help files and numerous source code samples (VB6/VBA/ASP/VBScript/C#/VB.NET/Delphi/BCB etc.). Put your processes in perspective! Many of our customers are owners of independent software businesses, others are high-level product managers, and others are senior engineers. Their end-users are important to them, and their applications are usually complex. Their bottom-line directly depends upon the OPC related functionality embedded in their product(s). When compared to all other customers in the market, these customers must spend the most time weighing up their options because their needs are the most challenging and important. "I spent a week evaluating several Windows controls and found OPCWare to be the easiest to use and the support was almost immediate when I had a question. In total it took me three days from start to finish to integrate the OPCWareX control into our product....OPCWare helped make me look like a genius to our company and will be my first stop for any further OPC development we require. Thanks guys." Chris Bowen, Senior Software Engineer with Syscon International, a leading real time plant information software manufacturer, USA. That is worth thinking about. When it comes to our customer's productivity, reputation, and product competitiveness - their bottom line in fact - they choose OPCWare Client Developer above the competition. In fact, many of our customers have spent more time making that choice than they've spent actually using our software, such is it's productivity. If your OPC requirements are as serious as this, no other tool or vendor is more focused on your success. Data Layers can even provide custom paid enhancements and source-code escrow services if you need these insurances. We listen and you profit. Our aim is to help our customers get from where they are to where they need to be. Our approach is to do whatever it takes. We have found this trust and co-operation to be mutually beneficial in the long run, and that our customers will come back to us again and again, success after success. We continuously allocate members of our development team to adding and improving features and code that most developers never see. But some do and each perspective is as important as the next. Then when the end-user of the software bombards it with data from multiple OPC servers from different vendors, some OPC compliant, some not, OPCWare Client Developer is there to keep things intact. Or when your development team has a major new requirement, or needs to develop in a different language, there is a range of supports available such as sample code, direct access to the experts, and knowing that you are not the first to do this, so the risks are minimised. It's hard to get this across easily because it is not immediately evident. That is why we urge you to play with our free demo, documentation and samples so you get to see some of these important and valuable features at first hand. For example, explore the hidden versatility of the events associated with the user interface built in to the OPCWareX control. Take advantage of our free pre-sales support. Let us know what you need to do in your projects and we will tell you if and how OPCWare Client Developer can do the job. We'll even write snippets of code to get you started. With a 30 day free trial, plus a 30 day money back guarantee, that's 60 days to change your mind. 1.) Have you ever needed to get data from a PLC, DCS, weighing scales, label printer, dimensional gauge, temperature transmitters, bar code scanner, or other industrial device but didn't know how? 2.) Wouldn't you like to find an easy and reusable software solution that enables you to interconnect all your processes, devices and applications? 3.) Do you need to connect your PC computers to your controllers, devices, processes and applications in an open and productive way? 4.) Do you wish you could quickly and easily deliver all the process connections you or your end users need, without having to spend weeks or thousands of dollars - something your existing HMI or SCADA application simply cannnot deliver? 5.) Do you want to plot trends, display and print reports, monitor and control equipment, or log seemingly inaccessible process data? Click here to reveal the quiz results. You can easily achieve these things you want with the powerful toolkit we are about to present in this article. Our OPC Client development product, OPCWare Client Developer is the essential suite of OPC software components used by hundreds of engineers and developers worldwide. You too can easily use it to leverage and connect to the hundreds of OPC drivers that are available off-the-shelf today. A world class product, Version 3.0.x is unique in its range and depth of features and functionality, offering unprecedented development speeds, as well as high performance and unlimited flexibility for your OPC client applications. No where will you find the same combination of ease of use and connectivity potential - much of this is not available anywhere else. It even includes working sample OPC applications for almost every conceivable software environment that might require OPC connectivity! In just 5 minutes, as you read every word of this article, you will learn that subscribing to a license for OPCWare Client Developer is the quickest and most cost-effective way for you to build first class OPC client applications with your language of choice, either completely from scratch, or as extensions to your existing applications. "I knew nothing about VB, OPC or databases ... but it was all straightforward with OPCWare Client Developer." John, Control Systems Engineer, Medical Device Manufacturer, Ireland. Download your free 30 day trial that also includes OPCWare Client Developer Free edition. More than 700 developers enjoyed the benefits of this software in 2004 - now see it for yourself. Choose the OPCWare Client Developer edition that suits your current applications best and place your order. Remember you get a 30 day money back guarantee and you can always upgrade your license later if have chosen the Lite edition and need a runtime free license. Make this leading toolkit yours...permanently. So the download includes 2 free components, plus another 2 components on a 30 day free trial. "Yours was the only demo I downloaded (and I downloaded quite a few) that I could make work with my server without any problem ... which gave me a higher level of confidence in your product." Are you getting runtime free distribution rights? Does it provide several free sample applications? Does it include an optional built-in GUI to cut development time? Does it support your current and future development environments? Does it protect you from the low-level details of OPC interfaces? Is it based upon open standards with expert support? "I do think that your software is the quickest, easiest, and most flexible of the ones that I have looked at. Also the support that I have received thus far on just evaluating your product has been great." Scott, Systems Engineer, Machine Builder/OEM, USA. So who uses OPCWare Client Developer? Are you an OEM, system integrator, IT or automation professional delivering process support and automation solutions in the process and manufacturing industries? Is your preferred development tool Visual Basic, Visual C++, Delphi, ASP, VB.NET, C#.NET, VBA (Excel, Access), Labview or another ActiveX container? Do you prefer to work with companies who have a reputation for outstanding customer service? Do you need to connect your PC computers to your controllers, devices, processes and applications in an open and productive way? Does your existing HMI or SCADA application simply not deliver the functionality you or your end users need? Do you need a cost effective MMI solution to interface with, monitor and control your PLC networks? Are you supporting legacy applications that use outdated technologies such as DDE, or custom drivers that won't share device access with other applications? Do you find that you cannot provide access to the data your end users are demanding from their process controllers and devices? Have you just about given up on ever trending, reporting, monitoring or logging this apparently inaccessible process data? If you answer yes to any of the above, then chances are your applications need an OPC interface and you should be using OPCWare. Many of our existing customers have already faced the same challenges as you, and have overcome them with the help of OPCWare. Get the OPCWare Client Developer product datasheet (PDF reader required). For industrial automation users who need to assemble interconnections between industrial devices and applications from different vendors, OPCWare is a suite of software components that enable rapid integration of software and hardware for data acquisition, monitoring and control. Unlike closed, proprietary systems, which require expensive, specialised support and often third party resellers, our products are based on open, industry standards, and are manufactured, marketed, sold and supported by us. 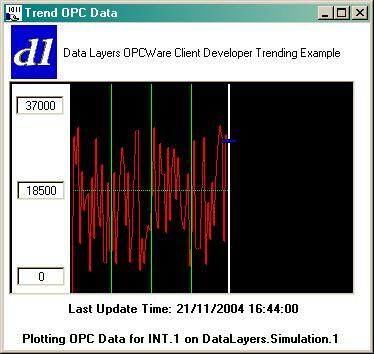 OPCWare is OPC software, which is an implementation of the widely adopted API standards embodied in OPC (OLE for Process Control) technology. 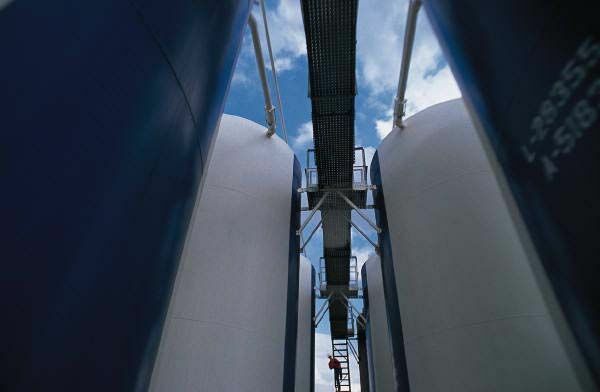 OPC is also Openness, Productivity, Connectivity. Our OPC component toolkit OPCWare Client Developer is the leading OPC Client toolkit that can be used with Visual Basic, Visual C++, Delphi, Excel, Access, VB.NET, C# and Labview, plus several other ActiveX containers. It provides easy to use powerful OPC client functionality delivered in the form of reusable ActiveX controls. These OPC ActiveX controls embedded in your applications will connect to Off The Shelf OPC servers which are widely available to add opc communications to a range of devices including PLCs, weighing scales, label printers, dimensional gauges, temperature transmitters. 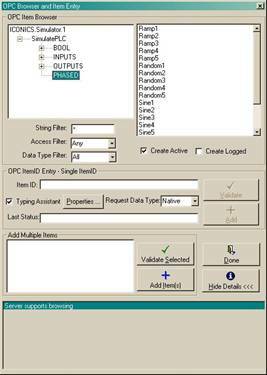 Using software created with OPCWare Client Developer, OPC connections are easily set up, and the process data can be moved in either direction, so you can read or write OPC data for monitoring and controlling, or you can log process data to a database, insert it into a spreadsheet, or display it in a web browser. New devices, controllers and PLCs can be added easily, and your application code does not need to be changed. All you need to do is decide what to do with the data. We provide source code that shows how you can use our components to display your OPC data graphically in real time, and how to log it to simple databases such as MS Access, or enterprise databases such as Oracle or SQL Server. In adition to the ActiveX OPC Client controls provided with OPCWare Client Developer, we also develop custom OPC Servers for our customers for those applications and devices where Off The Shelf OPC Server solutions are not available. A Data Layers custom OPC Server will OPC-enable any device, controls network, or application that is currently not open to OPC connectivity. Contact us today with details of your devices or applications and a customer representative will be in touch with you to discuss your OPC client and OPC server development project. OPCWareServerExplorer is a control that is used to browse and select available OPC Servers using a built-in Grapical User Interface (GUI). OPCWareServerExplorer allows end-users to browse the network and select any available OPC Server, to be connected to with one of the other three controls. The OPCWareServerExplorer control is normally used in conjunction with the OPCWareItemExplorercontrol to instantly build a full-featured OPC browser GUI. OPCWareServerExplorer is completely free, and will continue to function even after your 30 day evaluation period has elapsed. You will never see a reminder screen popping up with this control. OPCWareItemExplorer is a control that is used to graphically browse and select the available OPC Items on a selected OPC Server. If the OPC Server supports browsing, the OPCWareItemExplorer control enables the user to browse the server address space, seeing the available OPC ItemIDs in a hierarchical or flat structure as presented by the OPC server. OPCWareItemExplorer is completely free, and will continue to function even after your 30 day evaluation period has elapsed. You will never see a reminder screen popping up with this control. The OPCWareX control offers treeview and listview visualization capabilities (similar to Windows Explorer but with OPC servers instead of drives, OPC groups instead of folders and OPC items instead of files) for OPC DA Servers, and constituent OPC Groups and OPC Items. 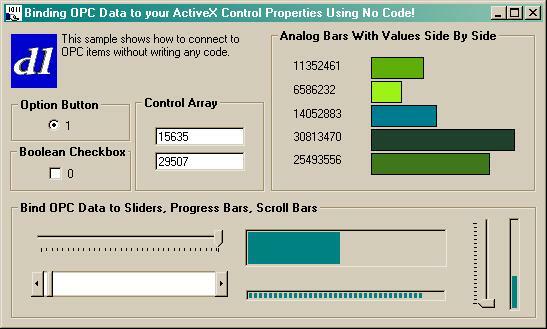 Intended for simpler OPC configurations than OPCWareX, and originally designed for Visual Basic 5 and 6 developers, the OPCWareGroup control provides code-free binding of OPC items to any properties of any controls on a Visual Basic form. For example you might need to display a temperature setpoint in a textbox, or show the current pressure variable on an instrumenation indicator. You can easily combine OPCWareGroup with standard VB objects, plus third party components such as the Global Majic Software Instrumentation ActiveX Library to create low cost, high performance HMI display screens without writing a single line of code. Several sample projects and files making use of OPCWareGroup and each of the other three controls are included in the download. Below is just a selection of the sample OPC client applications, developed using OPCWare Client Developer, and included in the free download . You can click on any of the images to see more information. All of the environments listed below are ActiveX containers, and thus support OPCWare Client Developer, which has also been used successfully with other development environments such as LabVIEW, PowerBuilder. The main VB6 sample application is a comprehensive OPC Client application, which includes an OPC Explorer, OPC data trending, OPC data binding and we also provide many more VB6 samples with source code. For example, we include a VB OPC client application running as an NT service using Microsoft's NTSVC.OCX. In the download you can see an example showing how to format a VB Date to show milliseconds. Another example shows you how to set up an ODBC DSN to log process or PLC data to a database such as SQL Server or Oracle. 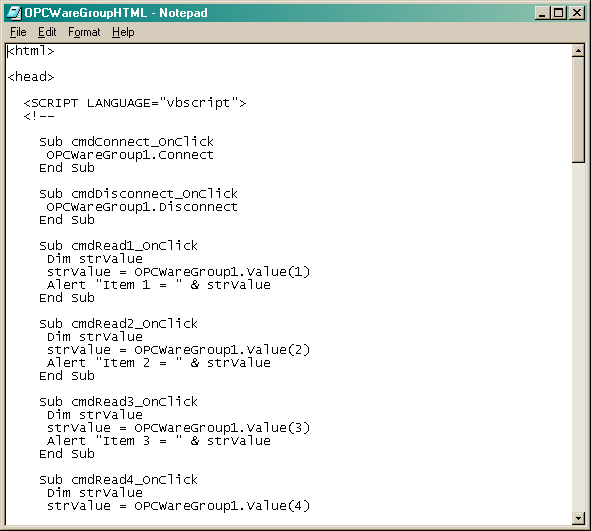 A simpler example logs OPC data to a local Access database. These samples will save you weeks and weeks of development time, to get your OPC systems developed and installed rapidly. You can easily combine OPCWare Client Developer components with standard VB user interface and database objects, plus third party components such as the Global Majic Software Instrumentation ActiveX Library to create low cost, high performance HMI and data logging applications. "I have a National Instruments LabVIEW 7.0 application that communicates with an Automation Direct PLC OPC Server. The OPC client functions supplied by National Instruments are not very efficient. In fact, NI examples recommend that I should use the older OPC client routines. I don't want to spend much time with the LabVIEW routines. I got an incredible head start with OPCWare. I was able to quickly create a LabVIEW application. The OPC communications performance was incredibly fast. A very important feature, maybe even critical, of your product is the ability to load configurations from a file. If I recall, I can configure the OPC stuff using a GUI interface and then simply use the file or I could create the file myself on the fly if I wanted. Good stuff!" - KR, Instrument Engineer & LabVIEW Programmer. If you�re a LabVIEW user, you too can gain access to all the benefits of OPCWare Client Developer. Get the free download and see it for yourself. If you are ready to begin developing with OPCWare Client Developer today, or if you're just interested in evaluating the software, you can download the installation. As soon as you have downloaded the installation, you should unzip and run the installation package. Next, you will need to register the keycode provided with the download link to temporarily activate the evaluation in demo mode. To make the most of your temporary (30 day) evaluation period, email us with your details, and a request for a sample application that demonstrates how OPCWare Client Developer can be used in your current projects. Any source code that you develop in demo mode will be fully compatible with the OPCWare Client Developer development and runtime versions should you choose to buy a licence. The installation includes several fully functional OPC Client demo applications, showing how to use OPCWare Client Developer, in a range of programming tools. 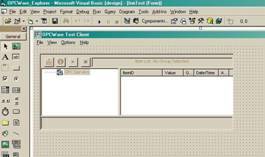 Full Visual Basic 6 Source Code can be viewed online to get a feel for the sample applications. The compiled VB6 sample application is a useful utility in itself for troubleshooting OPC connections. The OPCWareAX.ocx file is the main runtime redistributable and the evaluation version is identical to the full version. If you have already downloaded and installed the installation, and have finished your evaluation, then you already have the full OPCWare Client Developer installation, and you can buy your license(s) now. If not, you can download the installation. Keycodes for all license types can be purchased direct from Data Layers by credit card using secure online transaction processing or traditional Purchase Orders. Note: Some or all of the terms Microsoft, Windows, Visual Basic, ActiveX, OPC may be trademarks of their respective owners. Copyright © Data Layers Limited 2005. All rights reserved. "I do think that your software is the quickest, easiest, and most flexible of the ones that I have looked at. Also the support that I have received thus far on just evaluating your product has been great." - Scott, Systems Engineer, Machine Builder/OEM, USA. 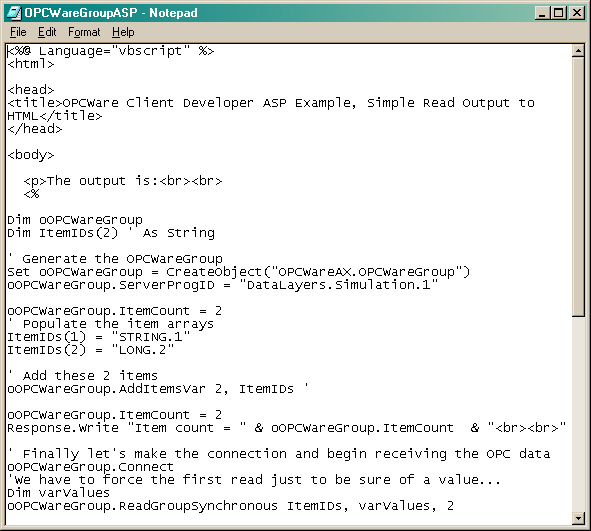 OPCWare Client Developer is a comprehensive OPC client developer's rapid productivity toolkit.